Last night, Elizabeth and I had gotten home from a Halloween party, and after putting the baby to sleep, realized that we hadn’t had dinner. 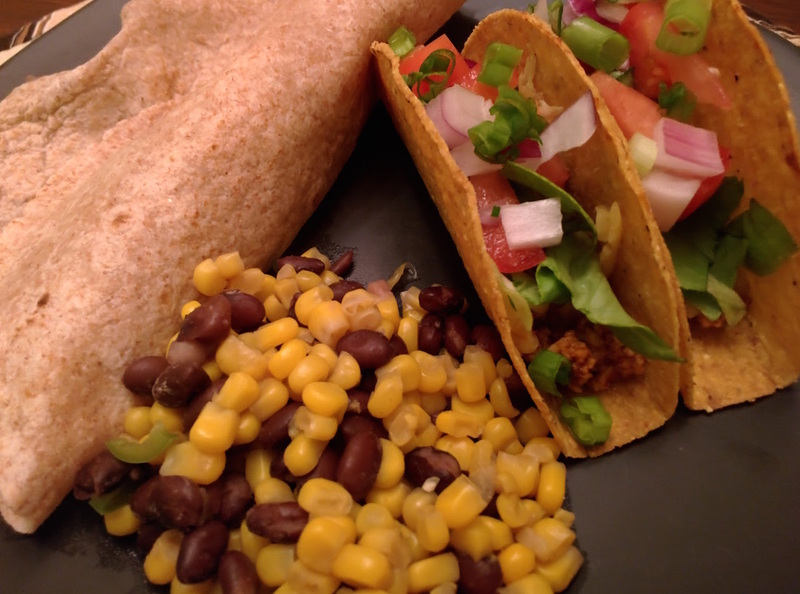 I found some frozen Costco carnitas meat in the freezer, and put it together with some corn taco shells. 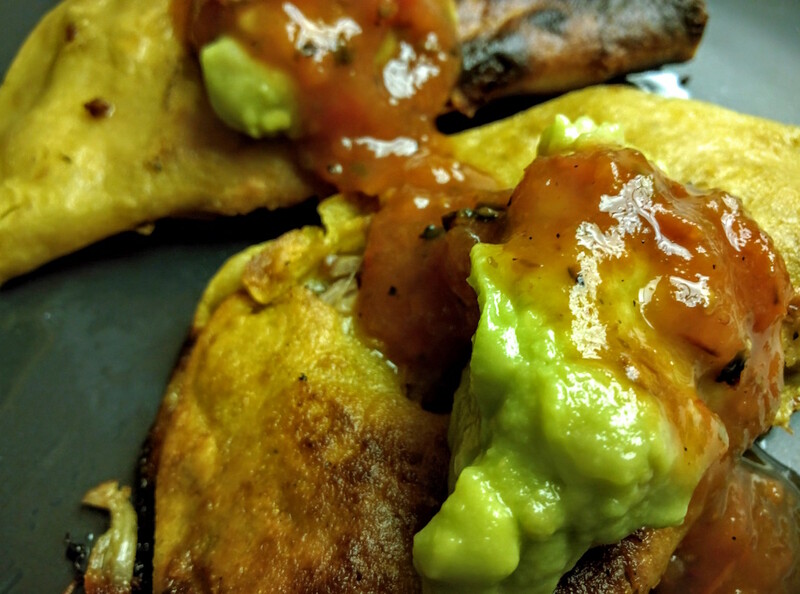 I quickly fried them up and topped them off with salsa and guacamole. This past weekend was another good weekend for food. While I didn’t go all out like I did Labor Day weekend, I still managed a few nice things. We had brunch, which was eggs Benedict with hollandaise sauce, hash browns, and a home made buttermilk biscuit. I used the immersion cooker for the eggs. I made the hollandaise the hard way, with a whisk, and it came out really pretty good. I was happy that my efforts were rewarded. 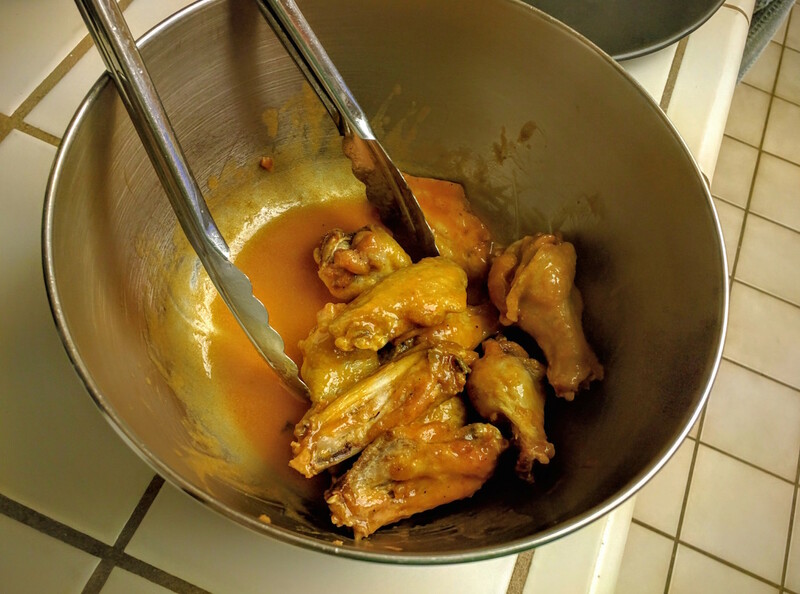 I was in the mood for Buffalo wings this week, and since I live in California, I had to make my own. They came out ok, but not spectacular. I fried them on the stovetop, and used an IR thermometer to monitor the temperature. I think that I didn’t cook them long enough to get them really crispy. The sauce was good though, and they were still better than anything that I could get at a restaurant here. Since I had bought the wings at Costco, I still had about 3lbs left, and decided to try the double fry method for the remainder. 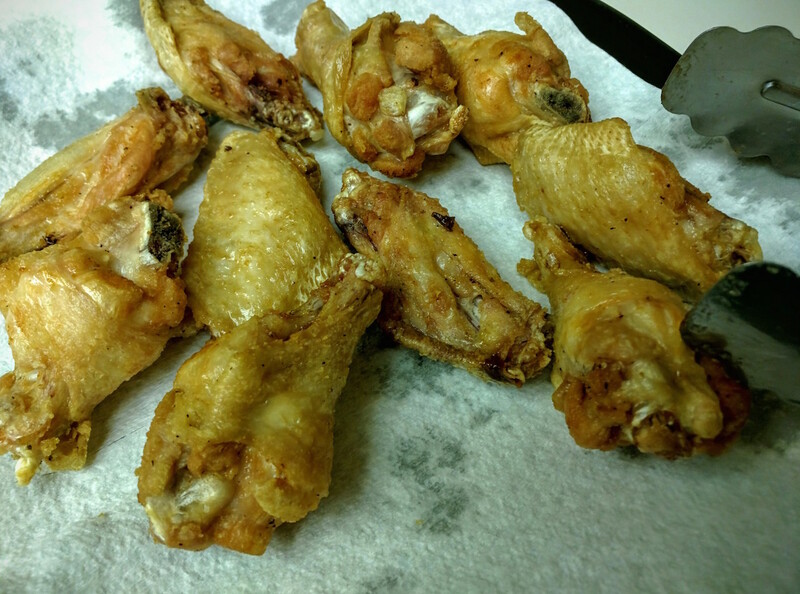 I fried them at 250ºF for 15 minutes, and then popped them in the freezer. 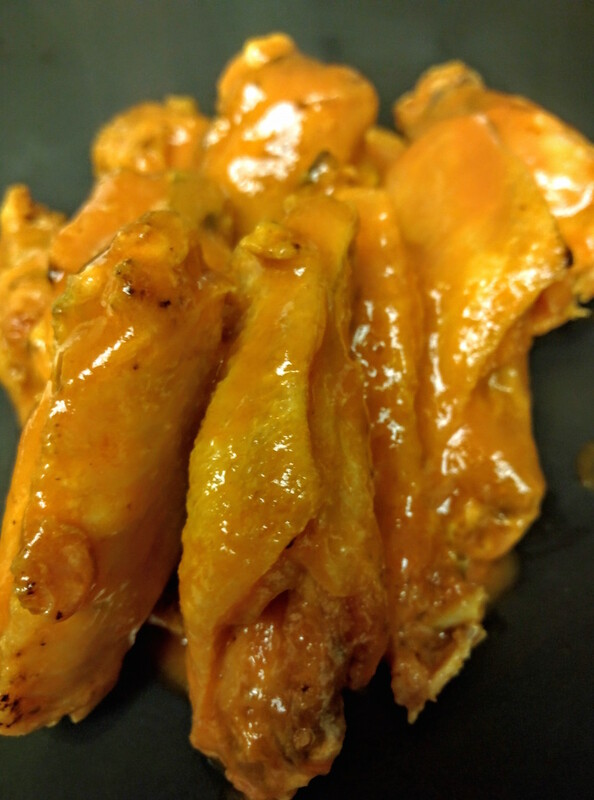 That’s the first half, whenever I feel like wings again, I’ll pull them from the freezer and fry them at 400ºF until they’re crispy. 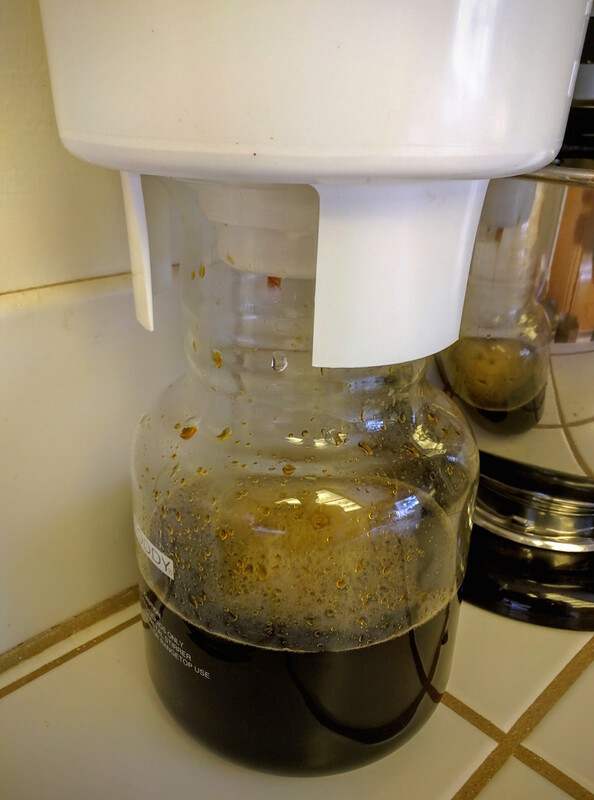 I roasted a pound of coffee, and made a batch of cold brew. 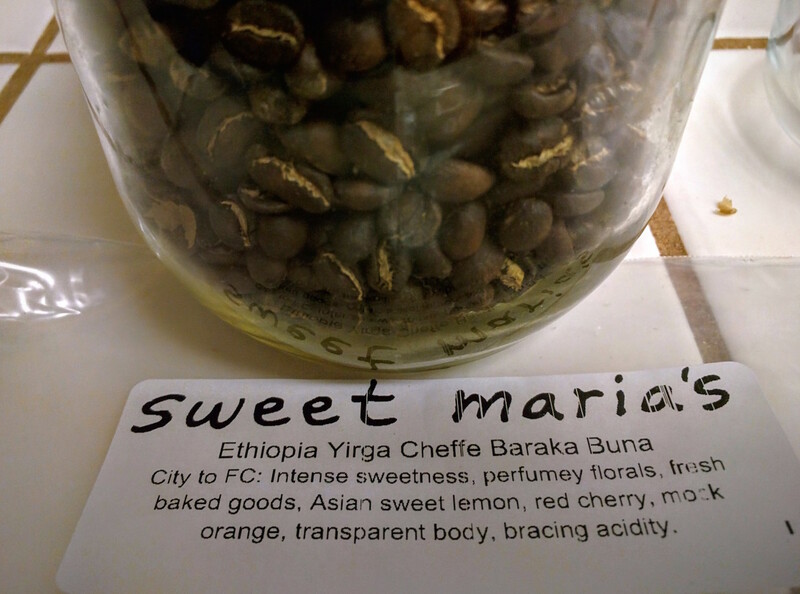 That batch of beans came out a little too light, I cut the roast after the first crack, it was very bright when I used it for espresso. 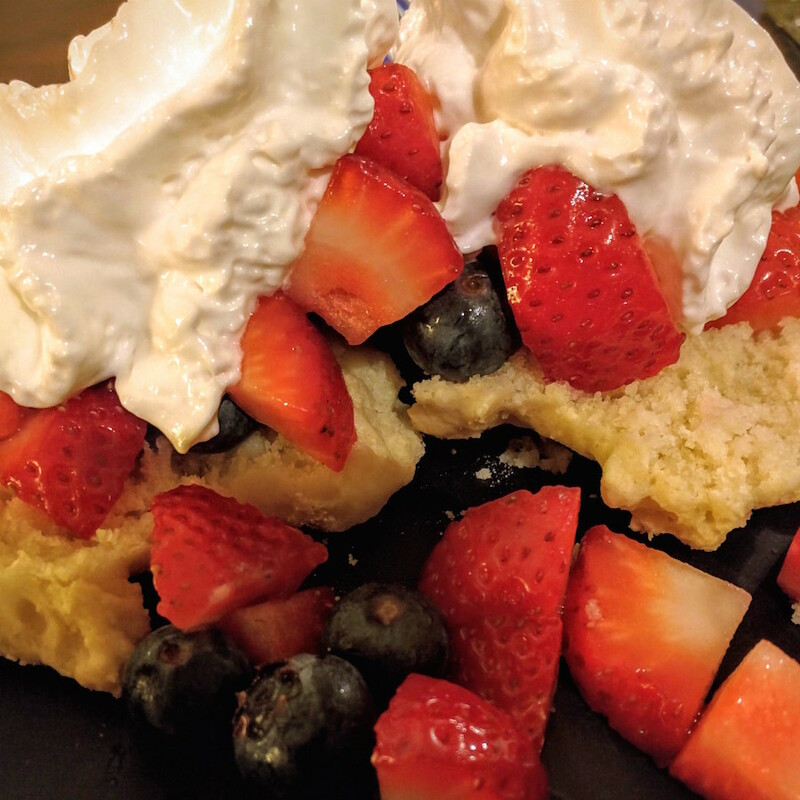 For dessert, I had made home made buttermilk biscuits, and we had strawberry and blueberry short cake. This weekend was an amazing weekend for food at home. I didn’t grill at all, but we ate well. I’ll share a couple of the meals that I made, one from Friday night, and the other from Monday’s dinner. I did make pancakes somewhere in there, but forgot about grabbing a photo. 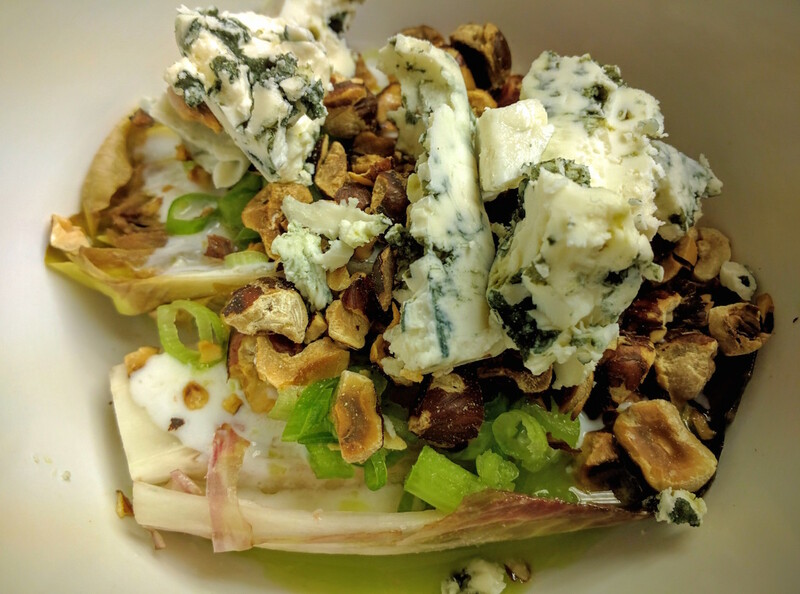 First up was Friday night’s dinner, a modified Warm Radicchio Salad, with endives instead of radicchio. 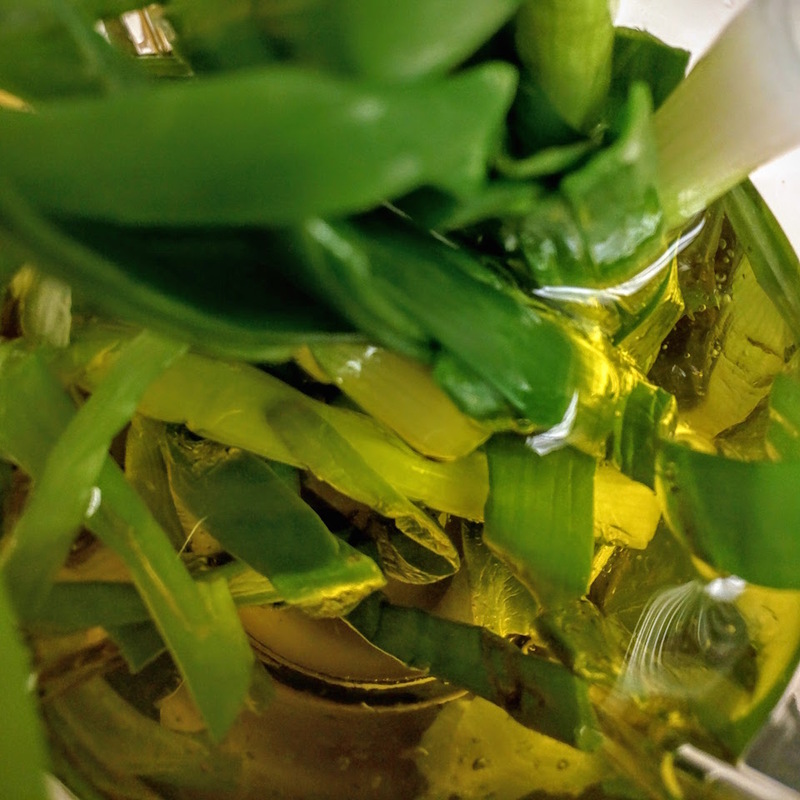 The salad was topped with a freshly made chive oil. 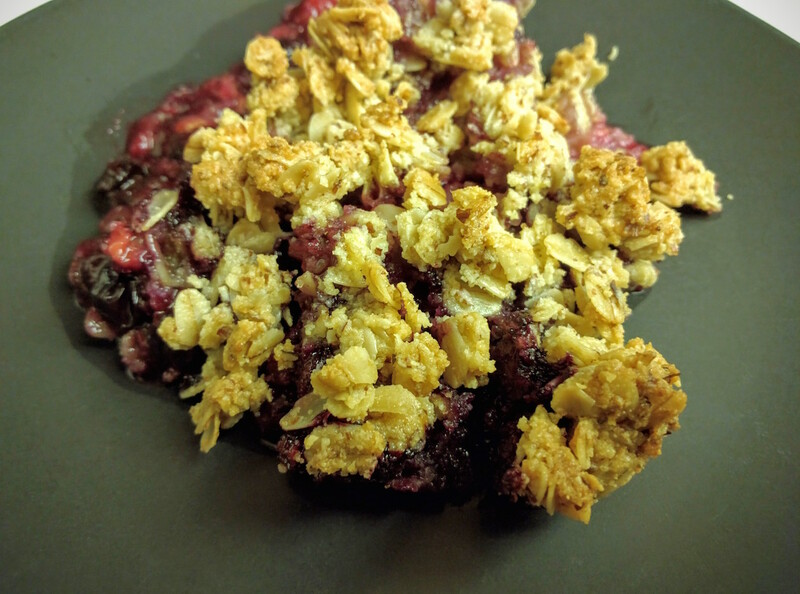 I made a Simple Fruit Crumble for dessert on both Friday and Monday. Friday’s was berries, Monday’s was plums. 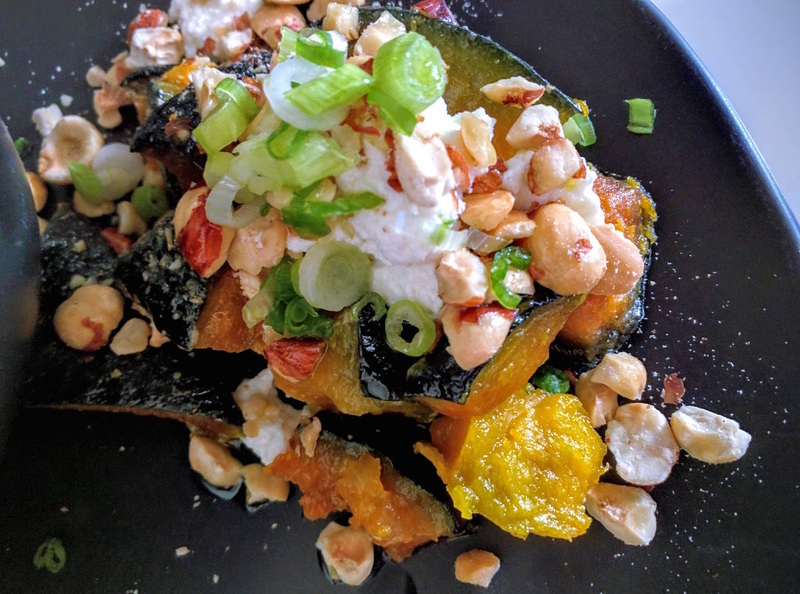 I made a Warm Squash Salad for dinner on Monday, again, using the chive oil. Our friends brought us some homemade kebabs to go with Monday’s dinner. 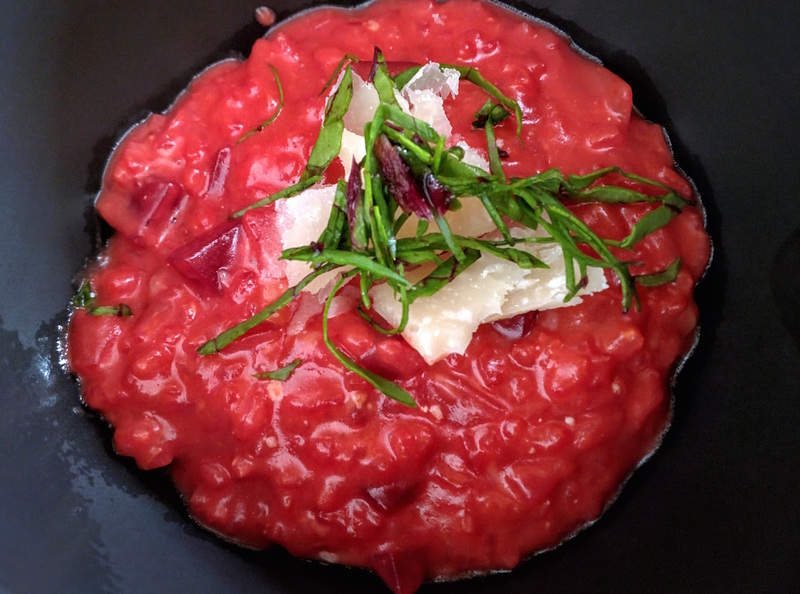 The main course on Monday was Beet Risotto, which involved juicing a raw beet. Yes, everything in the kitchen was red after that. 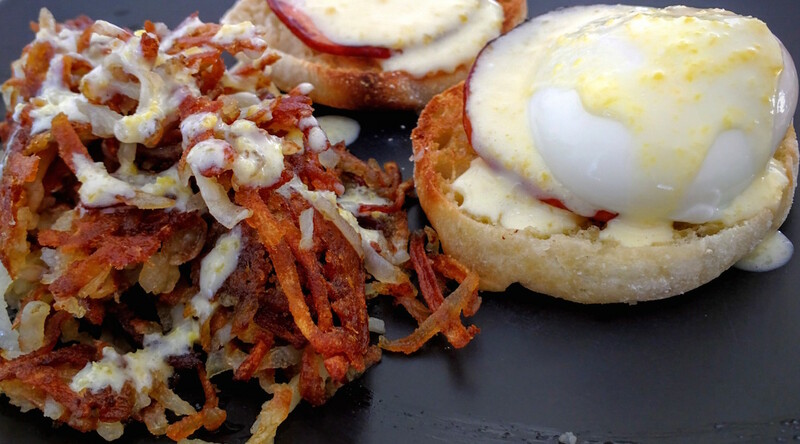 This morning, I decided to try making eggs eggs benedict with hollandaise sauce, and a side of hash browns. I used the Chef Steps 75ºC egg recipe, along with their recipe for hollandaise sauce. I’ll give the short versions below, what’s really nice about these two recipes is that they are both cooked at the same temperature, so you can actually cook them at the same time. Reduce the vinegar with the shallots, and strain out the shallots. 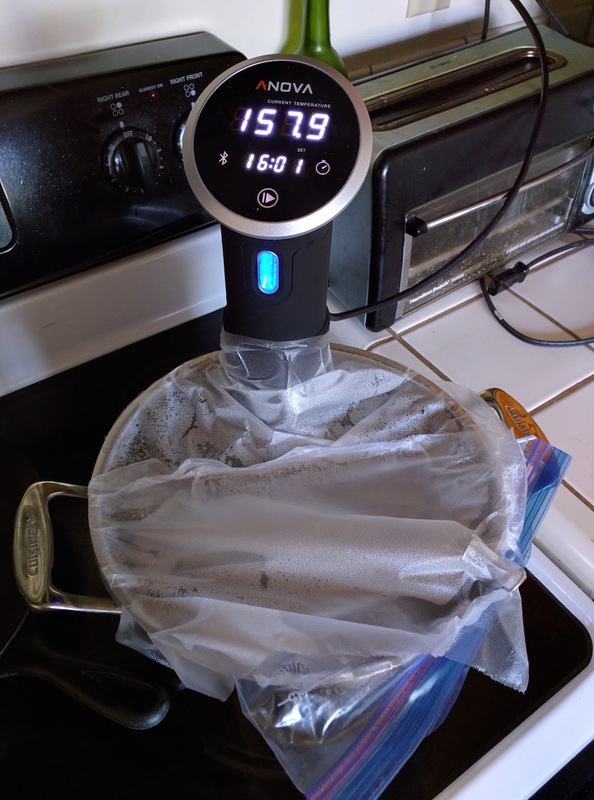 Then, combine 20g of the vinegar reduction with the rest of the ingredients in a bag (I used a food scale to get the amounts right), and then use your immersion cooker at 75ºC for 30 minutes. When it’s done, you’ll want to cool the ingredients in the bag a bit, by running it under cold water. Then use an immersion blender or food processor to combine the ingredients together. After the food processor, I put the sauce back in the bag it cooked in, and cut a small hole in one corner for dosing it out. When the hollandaise has 13 minutes left on the timer, drop 4 eggs into the water bath, and let them cook. When they’re done, crack them, strain them with a slotted spoon, and place on top of the muffin. The rest of this is pretty straightforward, so I’m not going to spell it out. 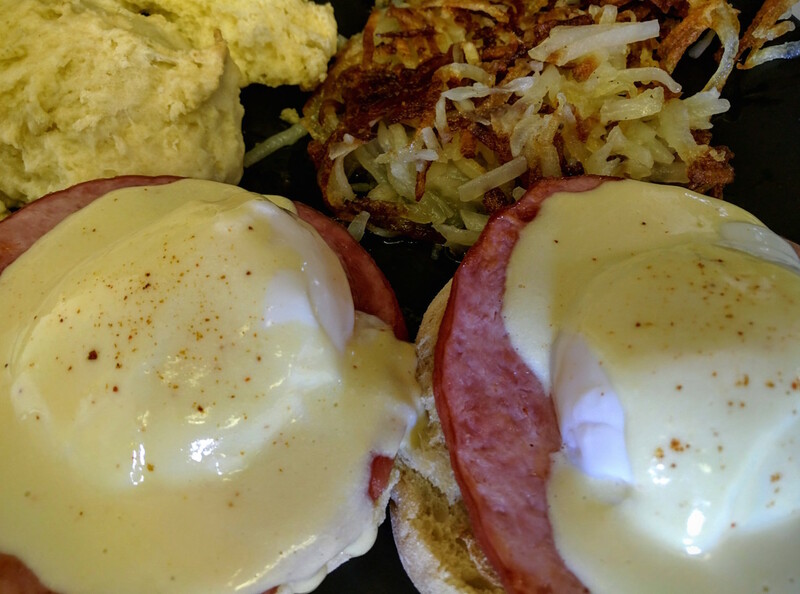 Though I will say that hollandaise makes for a great topping on crsipy hash browns. The hollandaise didn’t come out perfectly, since I substituted the champagne vinegar and shallot reduction with plain white wine vinegar. I also added a couple extra grams of lemon juice, which was noticeable. 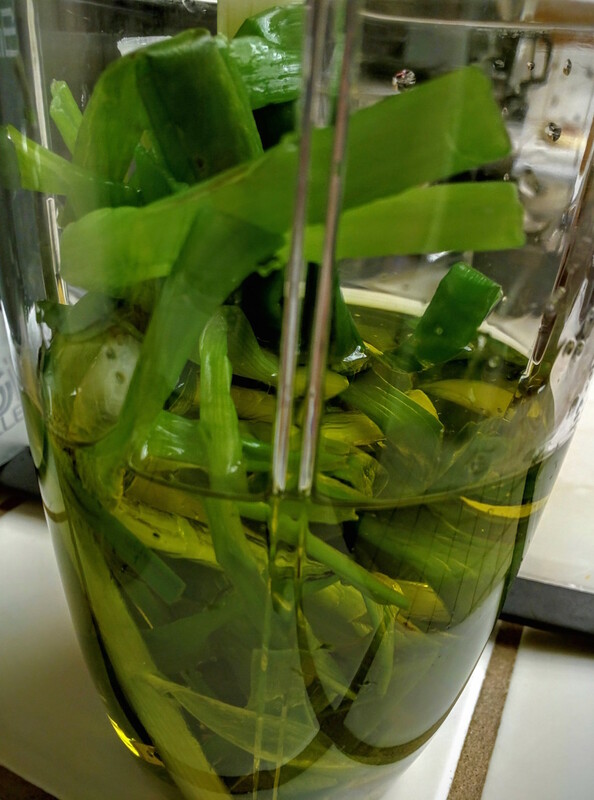 The larger issue, was that I’m not sure whether or not a food processor does the job, and I don’t know if an immersion blender would work any better. If you look at the photo, you’ll notice that the sauce is not entirely consistent. I’ll play around with it and try again sometime soon. Over the weekend, I bought a ton of meat and cooked it all on Sunday. I used the immersion cooker, and froze most of what I had made. From what I didn’t freeze, I took one pork chop, popped it in the food processor, and ground it up. I made pork tacos with it, and they were delicious. It’s pretty much just what you see there, pork, seasoned with taco seasoning and a sliced up chili pepper, lettuce, tomato, onion, and green onions. Then, on the side, I heated up some corn and black beans. 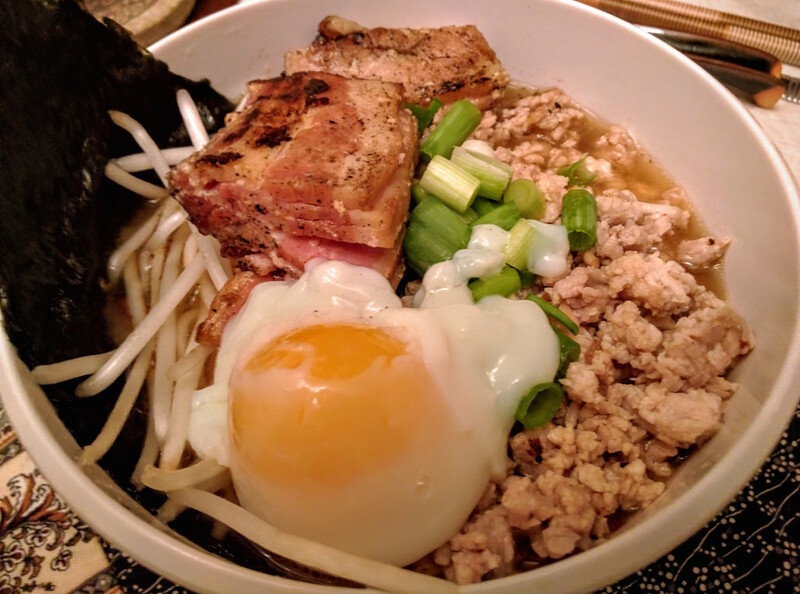 One of my favorite foods is Ramen, but I have never attempted to make it at home. It’s always seemed a bit daunting to me. 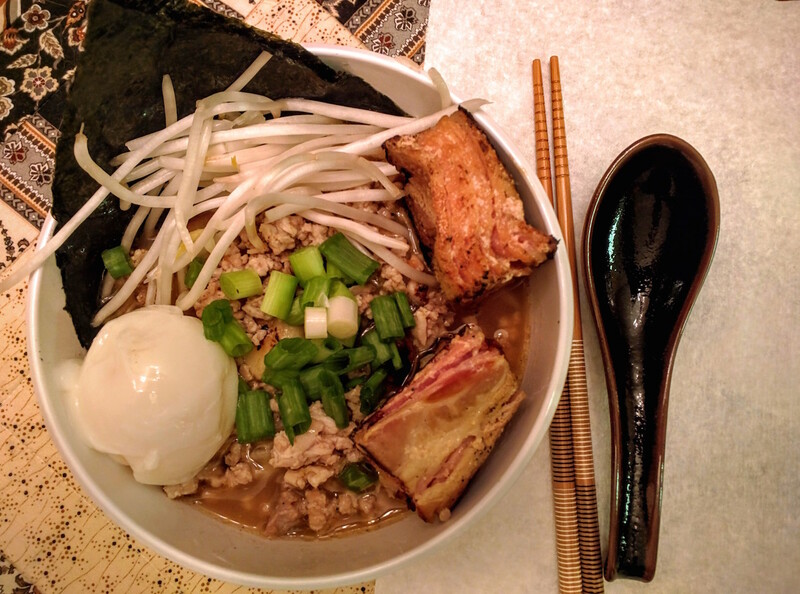 My favorite Ramen dishes have included pork belly. Since I bought my immersion cooker, I’ve been thinking about trying this out. I didn’t have pork belly, but I did have a lot of really good bacon. So, I attempted to cook the bacon as if it were pork belly. I set it up in the plastic bag with the slices stacked up next to each other, so that it was between an inch to an inch and a half wide. Then, I set the temperature to 158ºF for 16 hours and waited. That was on Monday, and by Tuesday morning, I had about a pound of bacon that had been slow cooked, and was ready to go. Yesterday morning, I went to a local Japanese grocery store to pick up the some ingredients for the dish. I found a couple of packages of fresh whole wheat ramen noodles with miso soup packets. I also grabbed some seaweed for garnish. I ground up one pork chop that I had slow-cooked over the weekend, and split that between two servings, heating it up in the skillet and setting aside. I heated up a skillet and seared all sides of the pork-belly/bacon. I used the immersion cooker to make poached eggs, slightly more well done, at 75ºC for 15 minutes. I followed the package instructions for the noodles and broth. I also roasted some garlic in the skillet. The dish came out tasting pretty good, but not quite what I wanted. There were a few things a bit off about it. Primarily, bacon is not pork belly. The bacon that I had was smoked, and that flavor was apparent and obvious in the final dish, overpowering much else. Beyond the bacon, the garlic was a bit too strong, and I should have taken more care with its preparation. Finally, the broth was a bit weaker than I had wanted, since I had intentionally made it a bit weaker than the package suggested. 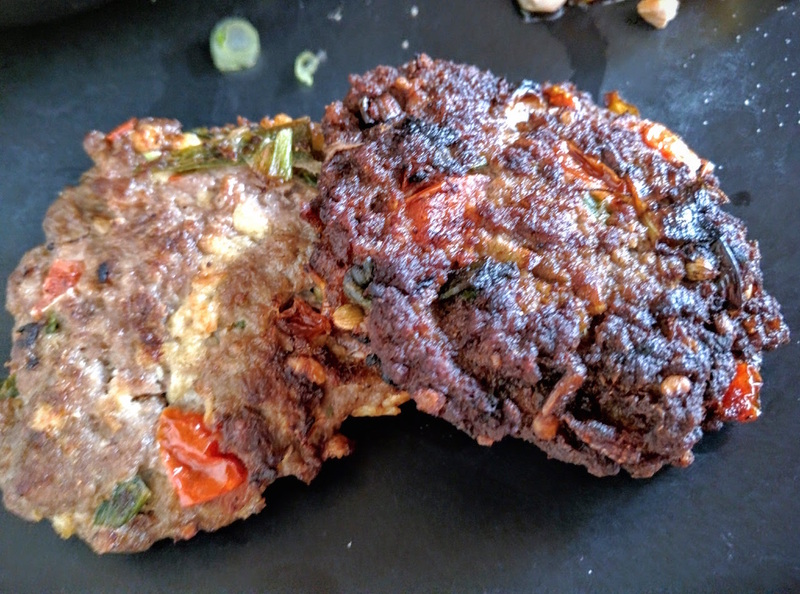 What I got right was the ground pork, and other ingredients. 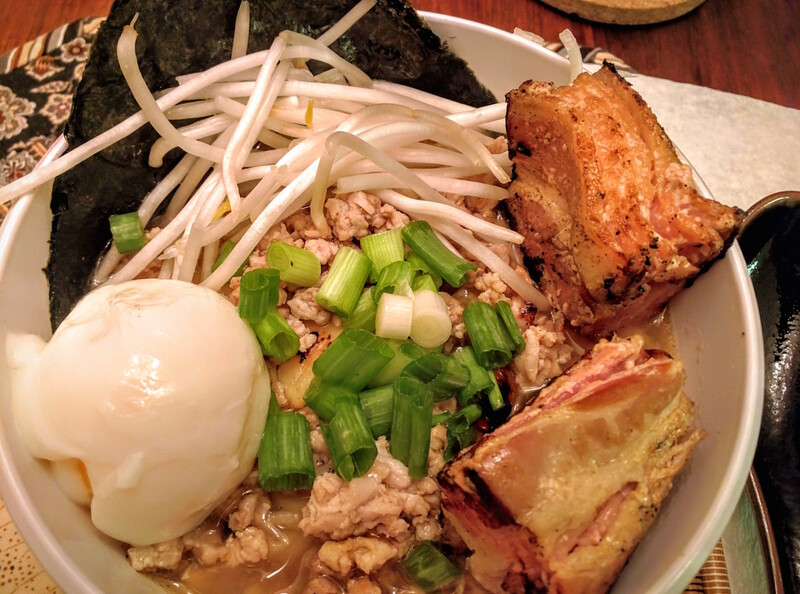 The egg especially turned out well, I liked that much better than the hard boiled egg that usually comes in Ramen. I’m planning on trying again this weekend. While I’ll still be using the bacon, I hope to at least fix the other issues. I read this article in the NY Times about an upcoming documentary, styled after “Super Size Me”, where a guy consumes 40 teaspoons of sugar a day. He does this while eating seemingly healthy foods. Reading that made me thankful for my wife, Elizabeth, who has been bringing this sort of thing to my attention for years, and has helped us to avoid this particular problem. Tonight, I decided to go with a fairly simple pasta. 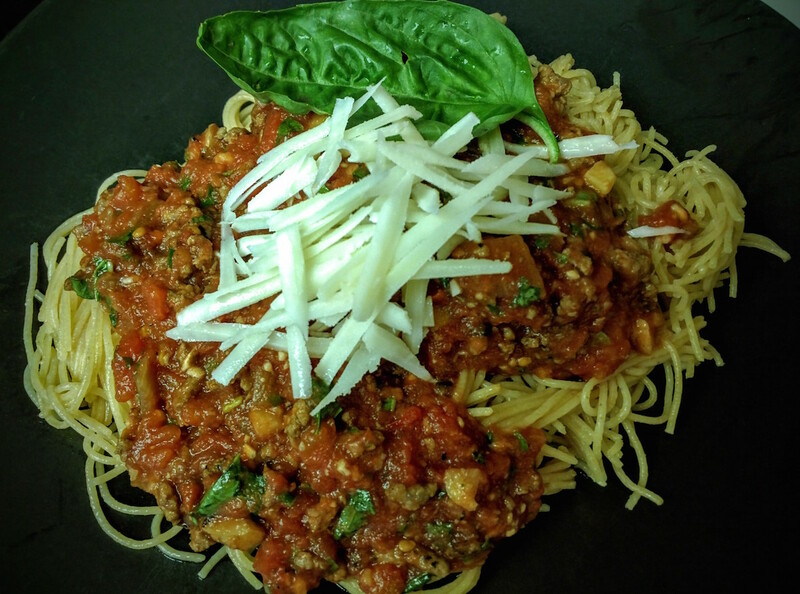 The noodles are capellini, the cheese is pecorino romano, and it’s topped with a home made red sauce. Dice the shallots, a few cloves of garlic, and a few mushrooms, and put them into a pan with some olive oil. Cook until the shallots start to turn clear. Add the ground beef, pulling it apart into small, even chunks, and reduce the heat down to medium. In a food processor, add the 28oz can of whole peeled tomatoes, 6oz can of tomato paste, 4 cloves of garlic, a few mushrooms, a bit of olive oil, and the fresh basil. Turn on the food processor, and run until it’s the consistency that you want. Once the meat is thoroughly cooked, drain the grease, and add the sauce from the food processor. 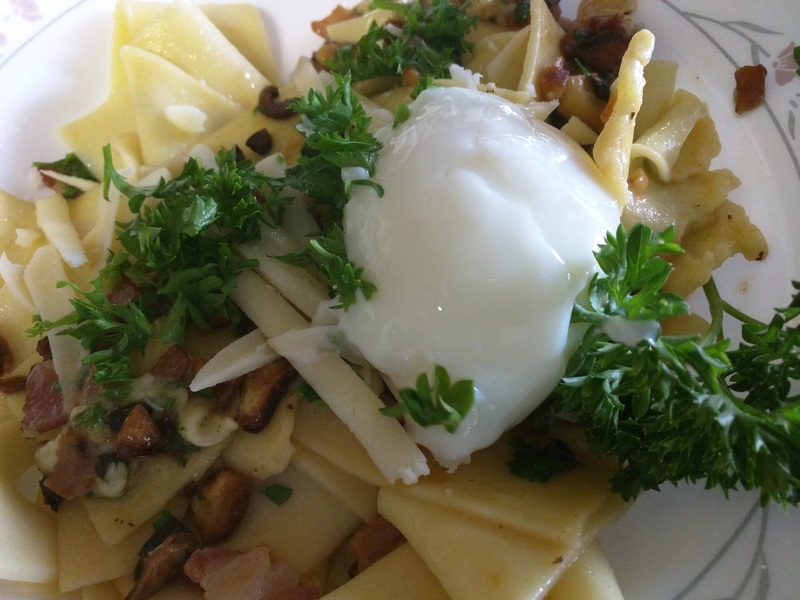 Tonight was a carbonara with a sous vide poached egg on top, and some parsley for garnish. It was amazing. Holy cow, the egg came out perfectly, exactly as I wanted it. It all came together very well, with some minor issues. 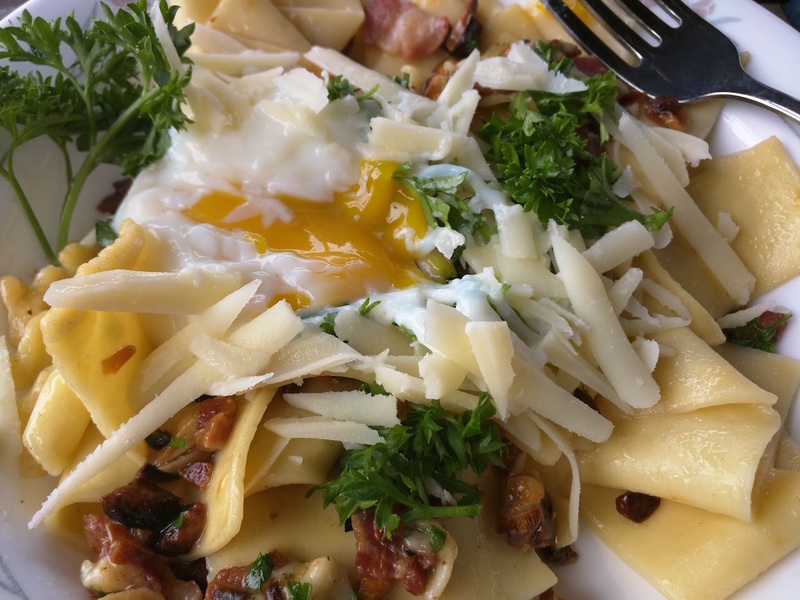 I had to make a couple of substitutions, typically carbonara has pancetta for meat, and pecorino for cheese. The grocery stores in the middle of nowhere don’t carry such fancy items, so I had to make due with bacon and romano cheese. The bacon was a little overcooked, which was the only real issue that I had with this dish. I used the egg calculator to choose my ideal egg texture and consistency: http://www.chefsteps.com/activities/the-egg-calculator . It gave me 69 °C for 20 minutes. Again, this came out perfectly. You cook the noodles until they are done, as normal. Cook the garlic and pancetta together until they’re done. Remove everything from heat. Drain the noodles, combine with the garlic and pancetta, add the olive oil, and optionally some pasta water. Then combine with half of the shredded pecorino and half of the chopped parsley. Crack a raw egg or two, and mix that in. Serve with the remaining cheese and parsley on top.